Pat Holland Conner is a writer, family therapist and substance abuse counselor. In her practice, Peaceful Path Consulting, her focus is self-esteem, awareness and local education. She has worked as a counselor in Asia, the Middle East and the U.S.A., and she brings this wide experience to Doorways to Significance, her first book. 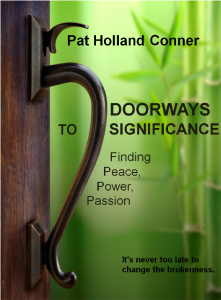 Inspired, passionate – these are words that will circle in your heart as you read Pat Holland Conner’s book about her journey. An African-American girl with white skin, she wrestled with identity, belonging, family and love. Pat’s journey from deep discouragement to involvement with the Peace Corps and then to a renewal of her life in America is both exotic and joyful. Read more about Pat Holland Conner on her Website: PathConner. And join her on Facebook.